I am not the biggest fan of chocolate, in terms of dairy based treats I am more of a cheese girl however I do love the snap of crisp easter egg shell, cold from the fridge, I love holding a whole chocolate egg in my hand and whacking it inelegantly off the table top until it shatters. I am still getting over the fact that you don’t find sweets nestled inside eggs anymore, that they are separately packed in the box. I love that most people I know still get giddy about chocolate at this time of year. I love that yesterday, in the midst of a very busy work day people in my office took the time to search for the chocolate bunnies I had hidden throughout our offices. I like that I know people my age who still give up chocolate for Lent who are now carefully planing exactly what kind of chocolate they are going to eat and in what order this Sunday. Last year I went home to Cork for the Easter Holidays and when I arrived in my Mum was in the middle of making Easter Eggs for my nephew who is celiac. Is is possible to find Easter Eggs that are gluten free but they tend to be dark chocolate and designed more for adults than teenage boys. Much to her well concealed annoyance I whipped out my camera and started photographing the process. As it was already Easter I didn’t post the images but just in case you have the time or the inclination over the next two days to play around with some melted chocolate and sweets I thought I would pop them up today. This isn’t the most detailed of posts as I discovered that making home made Eggs is a much simpler process than I had thought and just takes a bit of imagination to create some personalized Easter treats. 1 Standard sized Easter Egg mould. Available in catering or cake decorating shops. 250 grams of 40% chocolate (GF), chopped or broken into pieces and divided in 2 quantities of 125 grams. Sweets or cookies (make sure these are GF if making a gift for someone who is celiac) for decoration. My Mum used a gluten free Oreo type cookie which I still cannot find in Dublin! Melt one half of the chocolate either in a bowl over hot water or in a microwave at 30 second intervals, checking regular or over a bot of gently simmering water. Once this chocolate is melted add in the the second quantity of chopped chocolate to the bowl and stir in to the melted chocolate. This will reduce the temperature of the melted chocolate and also temper it to give a lovely sheen. Once both shells are fully cooled and hardened remove them from the fridge. Heat a metal tray under a hot tap and then dry it. Remove the shells from the moulds by turn them upside down on a table or other flat surface, if they don’t come out easily rub your hand over the outside of the mould and the heat of your hand will help release the shell from the mould. Place the shells on the heated tray to melt the edges of the chocolate and place the shells edge to edge until they stick together. If you want to put sweets in the egg put them in before you stick them together. 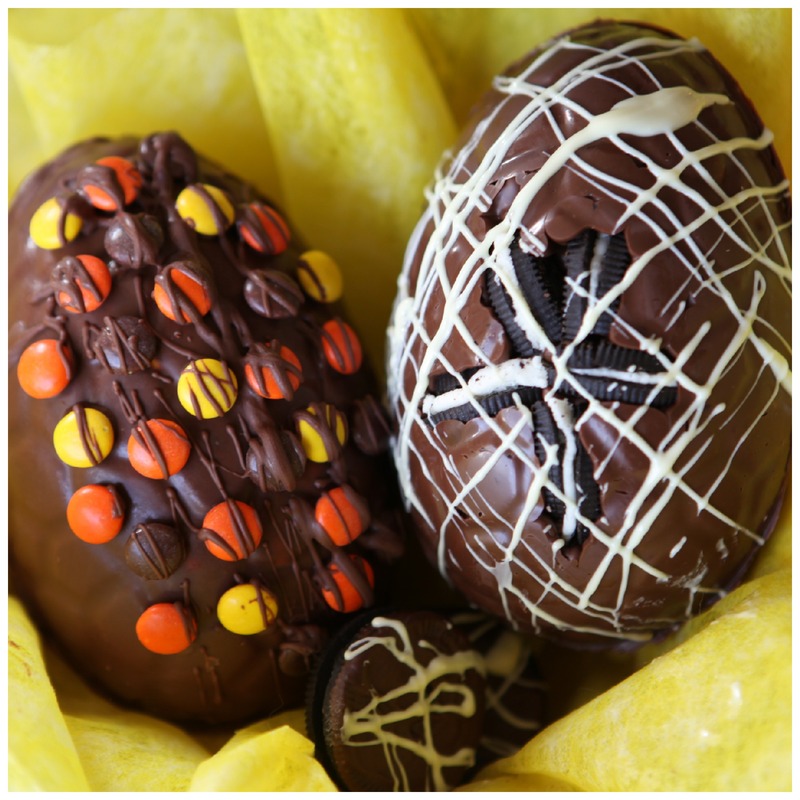 Leave the eggs for a few minutes so the edges can cool and harden and then you can drizzle over some more chocolate for an extra decoration. You can place the egg in a tissue paper lined basket or wrap it in clear cellophane tied with ribbon to make a beautiful Easter gift. Sometimes in the hustle and bustle of getting ready for Christmas it is easy to lose the sense of fun that should always be around this season. Shopping, food prep, making lists and checking them twice … it can all get a bit overwhelming so sometimes it is nice to take a few hours and sit around doing something relaxing, fun and crafty to get you back in the mood. There is nothing like sitting around with a glue stick, ribbon and glitter to fling you right back to your childhood. This is also a great way to get make some personalised decorations and cards if you want to add a homemade touch to your Christmas gifting. If you are going to work with glue and glitter please put down some old newspapers or some plastic sheeting on your table as despite your best efforts the glitter will end up sticking everywhere, this morning I was still brushing it out of my hair post shower. There are no real instructions here. Get some supplies, all of ours came from a fabric shop, an art & hobby shop and most importantly from a Euro store. Don’t spend too much money on your supplies unless you are a seasoned professional otherwise the fear will get you and you will be so worried about making a mistake that you will stifle all your creative impulses. This should be fun, browse the internet for suggestions, there are approximately one billion Christmas decoration ideas out there. Be inspired and give things your own twist. Cut a sheet of A4 card in half to give you two A5 sheets, fold these to a card shape. Measure out various coloured ribbons and cut them in graduated sizes so they make a Christmas tree shape when arranged on the card. When you are happy with the look of your design use the glue stick to secure the ribbons in place. Add a star or heart or some glitter to the top of your tree and leave to dry. Simple dimple and very pretty. 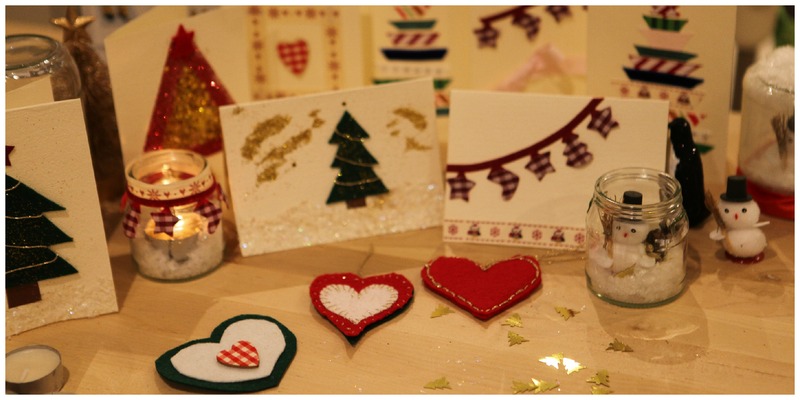 To make felt ornaments simply cut a cardboard shape and cut your felt to match, glue to the card and then stitch around with gold thread to secure and for a lovely decorative edging. This is meant to look handmade so don’t go mad striving for perfection. Stitch or glue on a loop of gold thread so you can hang your ornament. For a gorgeous nightlight holder take a clean jam jar, and cut a length of card to fit around the jar. Draw and Christmas scene, gingerbread house, snow and, tree on the inside of the piece of card and then cut around the design , stick the card around the outside of the glass and lightly spray the jar with fake snow or glue and glitter for a sparkly effect. Allow to dry and then pop in your nightlight, The candle light will glow around the silhouette or your design and will be lovely against a dark window. Another jam jar ornament was made by gluing a Euro store snowman to the inside of the lid of a jar, spraying the inside of the jar with fake snow and filling it with snow like sparkles, twist the lid on to the jar and turn it upside down so it rests on its lid, Decorate the lid with ribbon and there you have a lovely water free snow globe. Don’t be precious or worried that your efforts will look stupid, have fun with this. You can’t go far wrong with glue and glitter. The main point of this exercise is to take some time, hang out with friends, family or your kids and have some fun. Every woman has been there … you are rushing to leave the house, last thing is to throw on a quick necklace to finish the look, only to discover that the one necklace that suits this outfit has become entangled in every other decent chain you own. The only detangled choices are some plastic thing you got free with a magazine that the other necklaces don’t want to be seen dead next to, or a nineties number that really should not see the light of day again. In panic I inevitably shove the whole tangled mess into my handbag so I can pull them apart on the bus, but this leaves me with one, probably bent, chain that I want to wear and fifty extra swirling around the bottom of my bag, causing unnecessary weight and coiling like a boa constrictor around my purse and phone. After one particularly irritating incident where the bus journey was not long enough to detangle the one chain I wanted, I swore I could come up with a better storage solution that shoving all my costume jewellery into a box under my bed. And I did. I invested in two simple jewellery holders from Pennies. They were two sided, had little pockets and could be hung up. Alas, as Roy Walker would say ‘it was a good answer.. but it’s not right’. They were too small to fit all my jewellery in one pocket each, so I ended up putting two or three pieces in together, which inevitably tangled up together defeating the point of the change, or one big piece hid a small piece and I forgot I owned it. Also, being two-sided meant that I never looked at the pieces on the reverse side, and ending up wearing the same pieces time and time again. So, I decided I need a customised solution… a jewellery organiser that would hang on the back of my closet door and display all my jewellery at once, without allowing it to become entangled … queue the DIY music (vaguely similar to the MacGyver theme tune played on homemade bag pipes – music that inspires you to finish whatever you are doing fast so that the horrible sound will stop). Cloth – light but durable. I chose cotton. Cloth – smaller piece to reinforce top of organiser. I chose canvas because it is strong and I had some already left over from another project, but you could chose anything that can withstand weight. First things first, get out the sewing machine, blow the dust off it and check it still works. Select a fabric. I have a box where I store random pieces of fabric that I use for this type of situation. You will need something light but durable – I choose an old sheet that I had chopped other pieces from. Measure the door that you are going to hang the final piece on (and, I say from experience, don’t cheat and just measure the door closest to you at the moment – not all doors were created equal). Add 5cm around the boarder to allow for hemming. 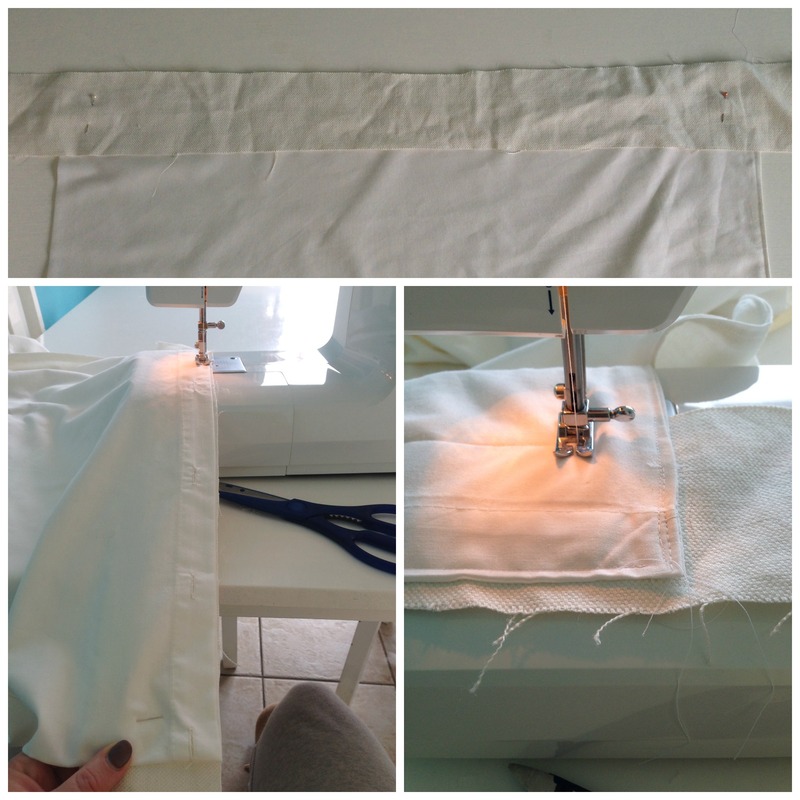 Cut fabric to size. I doubled the measurements and folder my fabric over to make it twice as thick. This is only necessary if you have a lightweight fabric. Take stronger fabric and sew it to top of organiser – this will prevent the lighter fabric from tearing under the weight of jewellery. 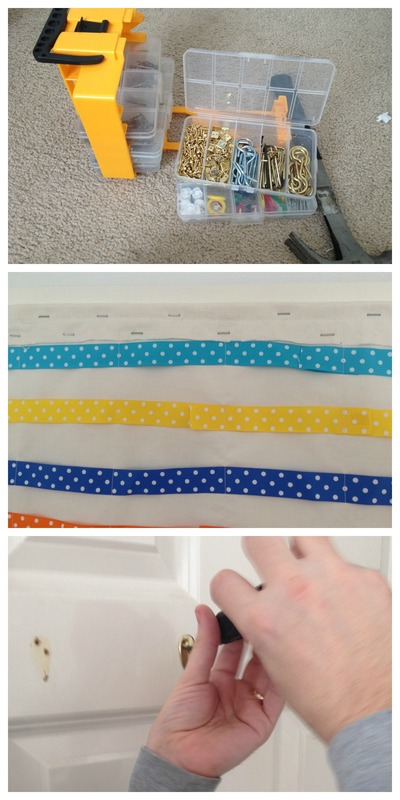 Take ribbon and lay them out across organiser to choose positions. I placed my ribbon with a 1cm gap at the top and graduated this to a 3cm gap at the bottom to allow for different sized jewellery. I also took the opportunity to recycle pieces of ribbon that we used in the menus for our wedding. Waste not, want not. Now, starting at the top of your sheet, sew across the ribbons from top to bottom at even intervals (depending on the size of your organiser). This will give strength to the ribbon and stop it from sagging in the centre when you add the jewellery. 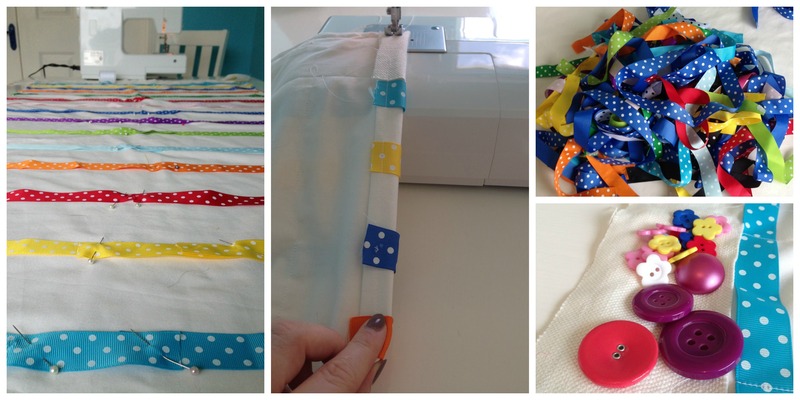 Sew some buttons if you like so you can hang rather than hook some pieces. Measure against door to double check size still correct. Hem boarder to give finished appearance. Nail or staple to door, ensuring that the top and sides are very secure. Hang jewellery and voila, the ability to get dressed and accessorise without earning your Scouts Knots badge. The style of my office is eclectic and offbeat. I created a bench of sorts from storage boxes and wanted some cushions for the top that suited the style of the room (funky, rocky, edgy, everything U2 are not) but didn’t break the bank (because cushions of these sort can be crazily expensive). At the same time I was trying to de-clutter my wardrobe as we headed from summer back to winter. There were a few tee-shirts with either great images or slogans that I didn’t want to throw out, but at the same time really could not be worn anymore. 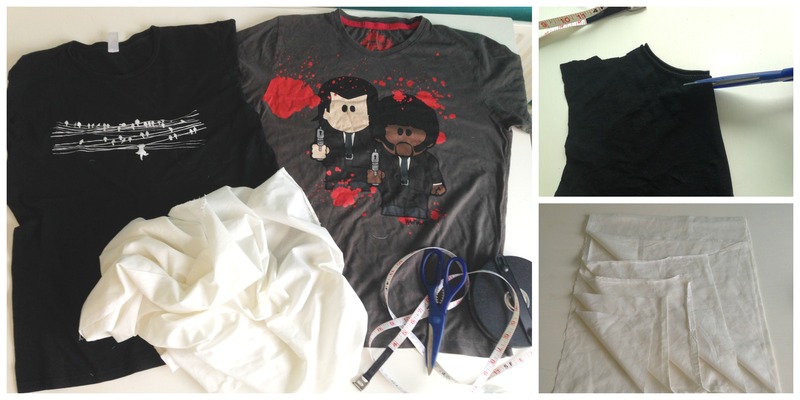 The two problems led to a beautiful solution: upcycling the tee-shirts to make customised cushions. Cushion stuffing. I actually recycled a flat pillow I was going to throw out, but you can buy this in Hickeys or the like very cheaply. Decide the size of cushion you would like. This will be dictated by the size of the tee-shirt you have; bigger the tee-shirt the bigger the cushion – that is why men’s tee-shirts are so useful. The measurements below are for a finished cushion about 45cm*40cm. I was going for an unfinished look, the beauty of which is that the is that the measurements do not have to be too exact here. Cut out 3 squares about 45cm*40cm from you backing cloth. I had a piece of cloth that was 137cm*77cm, so I just cut this into six equal parts – waste not, want not. They ended up 47cm*40cm. Cut out design from tee-shirt. This can be any size so long as it is less than about 40cm*35cm. This will leave enough room for the boarders. Sew around the boarder of the piece of the tee-shirt you want to be seen. Cut out front facing backing cloth to reveal pattern (love this reveal moment!). 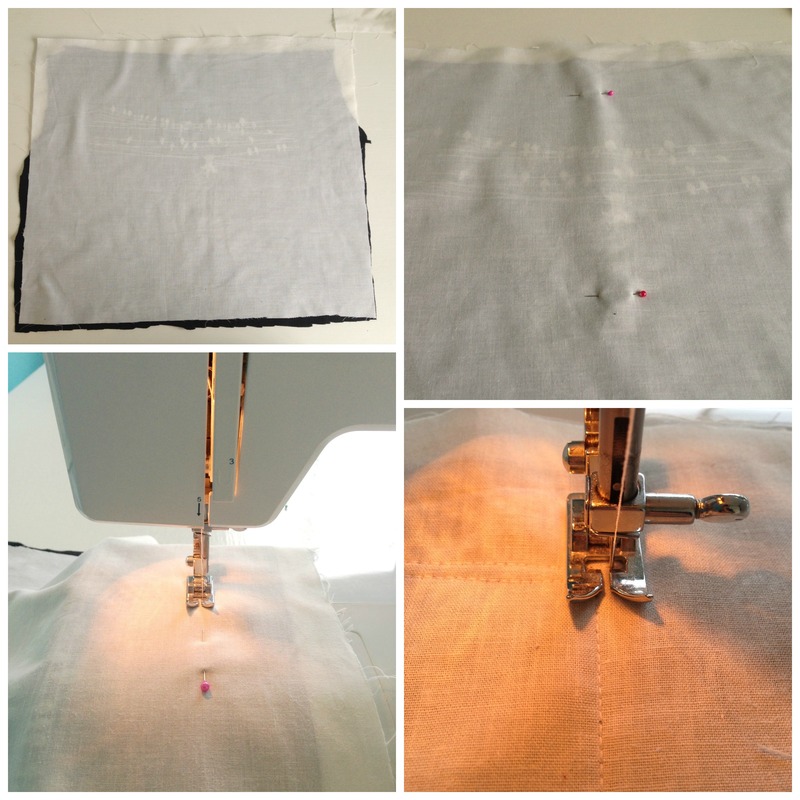 Take third backing square and sew a 1cm double hem around the edge. Don’t worry too much about being perfect – it is meant to look rough. Remember to leave a gap in the bottom corner to add stuffing. Sales season has started, and, if like me your household budget dictates that you must wait for the Sales to update things like bed linen, then this is a time of rapidly fluctuating emotions. The excitement of the potential finds as you make your way to the department store nice and early. You have probably being doing recon missions over the previous few weeks, so you know what they had in stock and what might potentially be in the Sale. The moment of ecstasy when you find the bed sheet that you are looking for in the correct size and colour marked down to €5. The moment of horror when you realise at there are no pillow cases to match. You frantically search again, scanning all piles, looking under and behind stands where experienced savvy customers may have hidden gems until they get a chance to come in and purchase them. Hawk-eyed you look at what the other customers have in their hands in case one is holding the elusive treasure unbeknownst to themselves, and might choose to put it down at any stage, giving you a chance to swoop in. In vain you might even try and ask the staff, who look at you like this is your first tour of duty and say ‘everything we have is out’. • Do you leave the bargain sheets behind, because really they are useless without matching pillow cases? • Do you buy the sheets and then search every other branch of the shop for the coveted cases, which takes HOURS and you may not even find them? 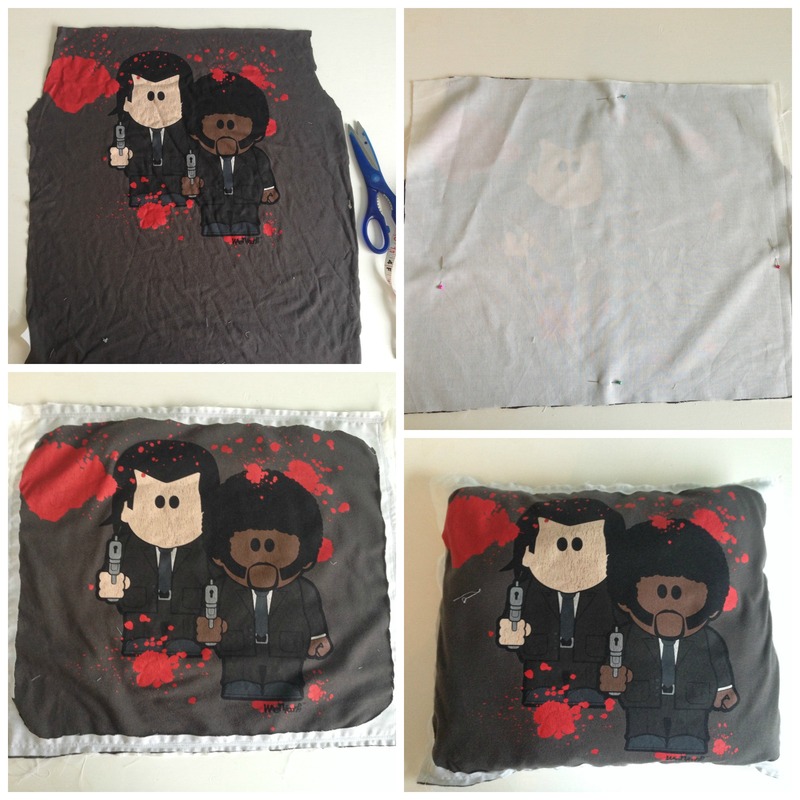 • Or do you simply buy an extra sheet and make your own pillow cases at some point? • Sheet from which pillow cases will be made. In terms of bang-for-your-buck the Single Flat Sheet is the best choice of sheet, because it is usually the cheapest of the set and at 260cm*180cm if will give you 5 pillowcases. The Double and King Flat Sheet will only give 6 pillowcases, there is more waste material and they are usually more expensive than the Single. 3. On the right side of the fabric fold the top down 20cm and fold the bottom up 75cm. Pin in place. This is the shape of your pillowcase. Now turn inside out to begin sewing. 4. Hem 1cm down the length on either side. Double hem to add strength. 5. Voila, one matching pillowcase. 6. Repeat for the number of pillow cases you need.